Biting without teeth is OK, then? Which came first, the children or the egg? The average family in the Philippines is about 500 or so. They would never miss one or two. BTW. If I can’t bite them – may I give them a good sucking? Breeding children for food. Its a worry. Good luck with keeping something dry and cool in the Philippines. My grandmother doesn’t have any teeth and could give you lessons. It’s nice to see that the Soylent Corp. is getting into the Easter spirit. “I like children, but I couldn’t eat a whole one”. Children are not included with the product. They cost eggstra. Would you like a lolly, little girl? 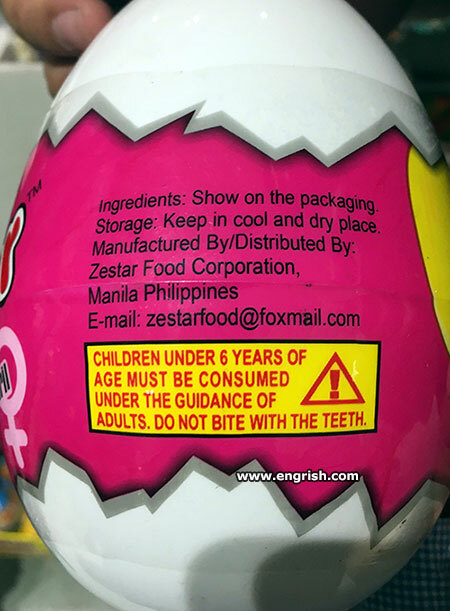 A lolly Easter Egg with a coating nearly an inch thick, would not require teeth. It would require a bloody jackhammer. I once bought my kids one about 5/16″ thick, they used a hammer to break it. I think it cost over AUD$100.00 in the mid 80s. But at least I only needed to buy one, for both of them to share. It stood about 2’6″ tall. It’s so difficult to be young and a cannibal these days. Not all children under 6 are that sweet. @Marum 1823: I guess that makes people who consume young children, humanitarians. If you purchase this at a supermarket, does this mean the contents are superhumans? I shall pass . . . such pain in the arse, not gorgeous at all !